Yesterday evening I called OverSoft to plan a new Ableton Live MIDI synced session. 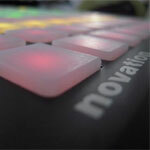 Since he has upgraded his MacBook Air for a pretty heavy MacBook Pro and also ordered a Novation Launchpad. To address the MIDI sync issues we do see from time to time we want to use MIDI Timecode instead of a MIDI clock signal. We hope this is more stable and in case of a sync issue it should be able to get back in sync because of the absolute time position that is transmitted. Unfortunately Ableton Live doesn’t support the sending of MIDI Timecode signals, it does support receiving them. So we will probably run a third party application on the MacBook pro that provides both Ableton Live applications with the MIDI Timecode signal.